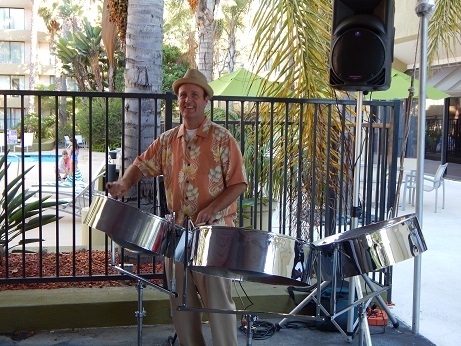 Todd Elliot Entertainment provides top quality professional wedding, event, and party steel drum, calypso, caribbean bands. We provide steel drum, calypso, caribbean bands for all of Southern California including Los Angeles, San Diego, Orange County, Santa Barbara, Palm Springs, and any cities in between. Check out more information below! The M Steel Drum Band is a high-energy performance group that specializes in blending Caribbean instruments and rhythms with American popular & world music. Our group features the unique instrumentation of steel drums, guitar, bass, and drumset. Our repertoire includes songs made known by Bob Marley, Santana, The Beatles, Marvin Gaye, and Barry White, as well as European classical music, jazz standards, and traditional melodies from the islands. Aside from merely entertaining ourselves and others with this music, we hope to introduce a new generation to the sounds of the Caribbean via the use of songs that most American’s can recognize. We also have solo/duo steel drum players available.